‘The Terminator’ Reboot Is Happening and Will Unleash Summer of 2015!!! Well, the deal has finally been made. Skynet will go live in 2015 and send Terminators to kill us all. I kid. I kid. But, Paramount has finally greenlit a trilogy of new rebooted ‘Terminator‘ films, with the first movie releasing June 26th, 2015. That’s two summers away. Megan Ellison, who is the daughter of a multi billionaire, got into the film producing business three years ago and has a pretty successful track record already. 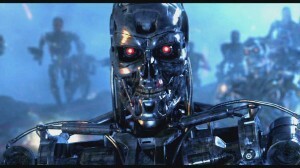 She purchased the rights to ‘Terminator‘ in 2011 for over $20 million and now has a three picture deal. Looks like Arnold will return as ‘The Terminator‘ again, but this time as the lead. I know James Cameron is busy with his ‘Avatar‘ sequels, but he really needs to be involved with these new films. The last two were less than stellar. Please get a good filmmaker to conjure a good film, because these movies are just explosions and guns. They are much more than that. Below is the press release. Tell us what you think. Skydance Productions, Annapurna Pictures and Paramount Pictures have jointly announced they will partner on a rebooted “TERMINATOR” movie, to be released by Paramount Pictures on June 26, 2015. Jai Courtney Will Play Kyle Reese in ‘The Terminator’ Reboot!! This entry was posted on Friday, June 28th, 2013 at 10:40 am	and is filed under Film, News. You can follow any responses to this entry through the RSS 2.0 feed. You can skip to the end and leave a response. Pinging is currently not allowed. « Check These New Images Out From ‘Curse of Chucky’!!! Could we maybe get Charlie back out here for a huddle? Sure, and while I'm at it, why don't you go climb that telephone pole and take a big steamy piss on the power lines! Look, I'm not here to twist your niblets. I'm here to save your life. But to do that, I'm going to need complete uninanonomonitity.